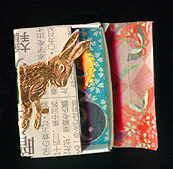 This is a workshop sample that I created, showing a pocket shrine in an embellished matchbox. The photo on the left shows the outside of the shrine, and the right photo shows the matchbox, opened. I cut the outside (the cardboard case) of the matchbox so that it would serve as a “door” to the shrine… it opens and closes. That part of the shrine is tacked in place with hot glue, at the back of the shrine. a small replica of a Chinese coin. The coin is held in place with hot glue. Super cool. I just started exploring art journaling–it can be a bit intimidating, but now I want to also try making matchbox shrines. So much fun. Just had a baby, so my “creative time” is quite limited, but I’m using every moment I can catch to follow my new passions. Thanks for being such an informative source of information and inspiration.